The youngest of three children, Huntington was born Anna Vaughn Hyatt on March 10, 1876, in Cambridge, Massachusetts. Her father, Alpheus Hyatt, was a professor of paleontology and zoology at Harvard University and MIT, a contributing factor to her early interest in animals and animal anatomy. She got her artistic nature from her mother, an amateur landscape artist, Aduella Beebe Hyatt. From an early age, Huntington followed the examples of her parents by acquiring both an extensive knowledge of the anatomy and behavior of animals and an enthusiasm for drawing. As a child at her family's summer home, Seven Acres, in Cape Cod and at her brother's farm, Porto Bello, in rural Maryland, Huntington developed an affection for horses. During her childhood sojourns in the countryside, Huntington also made her first clay models of horses, dogs, and other domestic animals. Although Huntington was fascinated by the animal world, she initially entered a private school in Cambridge to study the violin and spent several years training to become a professional concert violinist. At the age of 19, while suffering from an illness Huntington assisted her sister, Harriet Hyatt (Mayor), repair the broken foot on a sculpture the elder had produced. Pleased with the results, the elder Hyatt sister asked her to collaborate on a sculpture which included the family dog. The sculpture made it into an exhibition by one of the national art societies and was purchased. Having found both enjoyment and success in her first professional sculpture, Huntington turned away from the violin to study under Boston portrait sculptor Henry Hudson Kitson. Her first one-woman show was held at the Boston Arts Club. It consisted of 40 animal sculptures. Her original plan was to open an art school, however the death of her father and marriage of her sister to Alfred Mayor changed these early plans. Huntington left Massachusetts for New York City. In New York Huntington attended the Art Students League, where she studied under three sculptors: George Grey Barnard, Hermon MacNeil, and Gutzon Borglum, the designer of Mount Rushmore. Preferring to work independently, Huntington left formal instruction in favor of direct observation. Over the next few years, she spent much of her time at the Bronx Zoo. The figures modeled from these personal observations, including the 1902 equestrian work Winter Noon and the 1906 sculpture Reaching Jaguar, became Huntington's first major works. During this period, Huntington shared several studios with other young female artists and musicians; one of these was Abastenia St. Leger Eberle, another up-and-coming sculptor. 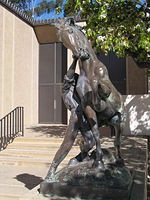 The two formed an artistic partnership that led them to collaborate on at least two statues: Men and Bull, awarded a bronze medal at the Louisiana Purchase Exposition of 1904, and Boy and Goat Playing, exhibited during the spring of 1905 in the gallery of the Society of American Artists. The two sculptors worked together for about two years before following their individual paths, Huntington preferring a more traditional style and Eberle favoring the more modern Ash Can style. By 1907, Huntington felt confident enough in her abilities to travel to Europe. Choosing to forgo academic study in order to pursue her craft independently, Huntington took a studio in Auvers-sur-Oise where she modeled two more jaguars that were exhibited at the Paris Salon of 1908. In the autumn of 1908, Huntington left France for Naples, Italy, to work on an enormous lion commissioned by a high school in Dayton, Ohio. Huntington returned to the United States for the dedication ceremonies, but went back to France about a year later to commence modeling another grand-scale piece. For years, Huntington had wanted to produce a life-sized equestrian statue of Joan of Arc. She now devoted herself entirely to this goal. This early model garnered an honorable mention at the Paris Salon of 1910, and led to Huntington's being offered a commission by the City of New York to produce the model in bronze to honor the saint's five-hundreth birthday. Huntington’s process for creating her large-scale equestrian Joan of Arc demonstrates her dedication to her art. After thoroughly researching the history of Joan of Arc, painstakingly searching for the perfect horse model, renting a large stable-studio in Paris, and consulting the curator of armor at The Metropolitan Museum of Art for accurate accoutrements. On December 6, 1915, the Joan of Arc sculpture was unveiled in an elaborate ceremony, which included a military band and French Ambassador Jean J. Jusserand. Mrs. Thomas Alva Edison was among those selected to pull the cord that released the shroud. Huntington went on to have a long and illustrious career, and also sculpted the statue of the Cuban patriot, José Martí (1965), which stands at Central Park South and Avenue of the Americas. A replica of Joan of Arc stands in front of the Palace of the Legion of Honor in Golden Gate Park, San Francisco. Throughout this period, Huntington received several other commissions and honors, raising her career to new heights. In 1912, she was one of only 12 women in the United States making at least $50,000 a year; in 1915, she received the Purple Rosette from the French government; and in 1916, she won the Rodin Gold Medal from the Plastics Club of Philadelphia as well as becoming an associate of the National Academy of Design. After devoting herself to farm work at Cape Cod during World War I she returned to sculpting in 1920, taking on many large commissions and moving to New York City. In 1920 she received the Legion of Honor from France and the Saltus Gold Medal for Artistic Merit from the National Academy of Design. In 1922 a replica of her Joan of Arc bronze was erected in Blois, France, and the French government made her a Chevalier of the Legion of Honor. Huntington also created Diana of the Chase (also known as Diana, or Diana of the Hunt) in 1922. She first modeled and exhibited Diana at the National Academy of Design where it won the Academy's Saltus award, her second in two years. She was also elected as an academician of the Academy. Around 1923 Huntington was working with railroad heir and philanthropist Archer Milton Huntington on an upcoming Hispanic Society sculpture exhibition. It was their common love of the arts that first brought them together. They married on March 10, 1923, in Huntington's studio on her forty-seventh birthday. It was her new husband's birthday as well. Archer was born March 10, 1870 and Anna was born March 10, 1876. Archer was previously married in 1895 to Helen Manchester Gates, an author. They divorced after more than 25 years of marriage and Gates later married Harley Granville-Barker, a British playwright. Both Anna and Archer flourished in their marriage and Anna characterized Archer as the ultimate sculptor's husband who supported her work not only financially but emotionally as well as spiritually. He lost a great deal of weight and wrote many books of poetry. The couple took an extended honeymoon; following their return to New York, Huntington took on several new commissions, including her second major equestrian work, El Cid Campeador, in honor of the medieval Spanish warrior. In 1927, she contracted tuberculosis and had to reduce her output dramatically. Most of her works during this time were inspired by her husband's fascination with Spanish culture; she produced a number of pieces for the New York grounds of the Hispanic Society of America, founded by her husband. In spite of decreased production, Huntington continued to enjoy public recognition, as detailed in Sculpture in America: "[Huntington's] Fighting Bulls received the Shaw Prize at the National Academy of Design show in 1928, and the following year she received the Grand Cross of Alfonso XII from the Spanish government; in 1930 she won the Gold Medal of the American Academy of Arts and Letters, and two years later Syracuse University gave her an honorary Doctor of Arts degree in recognition of her work. Huntington was also made an Officer of the French Legion of Honor in 1933. In 1936, the American Academy of Arts and Letters held a retrospective exhibition of 171 of Huntington's works in New York. The following year, she received the Pennsylvania Academy's Widener Gold Medal for Greyhounds Playing. Huntington then arranged for 65 pieces from her 1936 New York exhibition to tour the United States through 1938 and 1939. In the late 1930s, the Huntingtons donated their Fifth Avenue townhouse to the National Academy of Design and left for a Haverstraw, New York, estate called Rocas. While here she acquired her own zoo featuring monkeys, bears, wolves, and wild boars for use in continued animal modeling. After a few years, the Huntingtons donated this estate and zoo to the state of New York and moved in 1939 to a large farm, named Stanerigg in honor of the Huntington's Scottish deerhounds, in Redding, Connecticut. Here she began experimenting with aluminum, a lightweight, highly portable media that allowed for more dynamic compositions. The sculptor continued to create lively surfaces with rich modeling combined with abstract, stylized features borrowed from modernist trends. Huntington spent the duration of World War II on both her art and on wartime support, including the canning of produce from Victory Gardens and the sponsorship of a chapter of the Red Cross in her home at Stanerigg. Notable pieces dating from this era include two bas-reliefs at New York's Hispanic Society Museum, Don Quixote and Boabdil. In 1948, the National Academy of Design acquired Diana, placing it as the centerpiece of the main stairway of its building, ironically the former home of Anna and Archer Huntington. The sculpture became the unofficial symbol of the Academy itself. Other casts of the sculpture grace many parks and museums across the United States and can be found in France, Cuba and Japan. She was one of 250 sculptors who exhibited in the 3rd Sculpture International held at the Philadelphia Museum of Art in the summer of 1949. With the advent of the 1950s, modern, abstract sculpture began to replace Huntington's more traditional, academic style, much to the artist's dismay. Huntington was quoted in American Women Sculptors as referring to modernism, "as an overwhelming flood of degenerate trash drowning sincere and conservative workers in all the arts." Her husband became ill and Huntington spent much of her time caring for him. However, she continued to work, producing even larger pieces such as the equestrian Lady Godiva for an art association in Indiana and a group of large figures entitled The Torch Bearers, installed in Madrid in 1955. Following Archer Huntington's death in 1955, Huntington returned to full-time art work, despite being in her 80s. Between 1959 and 1966, she completed five more equestrian statues, including one of the late nineteenth century writer and activist José Martí; one of a young Abraham Lincoln; and one of a young Andrew Jackson. On Huntington's ninetieth birthday in 1966 she was still working, reportedly on a bust of the composer Charles Ives. Around the end of the 1960s, Huntington finally retired from creative work. She died on October 4, 1973, in Redding, Connecticut, following a series of strokes at the age of 97. In 1930, the Huntingtons purchased approximately 7,000 acres of former plantation land in the coastal region of South Carolina to provide a better winter environment for Huntington's illness. The milder climate permitted Huntington to resume work, and the estate, Brookgreen Gardens, became the first modern sculpture garden when the grounds were opened to the public in 1932. The Brookgreen collection includes many works Huntington completed while living at Atalaya, the Huntingtons' winter home on the estate, including several cast in aluminum—some of the earliest sculptures to use that medium. Brookgreen also features figures by many other sculptors of the era. A Guide to the Sculpture Parks and Gardens of America commented that, "[d]uring the Depression years of the 1930s, the Huntingtons' acquisitions were a boon to struggling artists; in its first six years, the Brookgreen added 197 art works." Brookgreen now has over 900 works dating from the early 1800s to the present. Every important American figurative sculptor is represented there in at least a model if not a full-scale work. Brookgreen Gardens is now a National Historic Landmark with the most significant collection of figurative sculpture, in an outdoor setting, by American artists in the world, and has the only zoo accredited by the Association of Zoos and Aquariums on the coast of the Carolinas. The thousands of acres in Brookgreen's Lowcountry are also home to a Wildlife Preserve and for those interested in the native plants in the southeastern region the E. Craig Wall, Jr. Lowcountry Center is home to the Cultural Garden, a display of vegetable and herbs grown during the plantation period. Adjacent to Brookgreen is Huntington State Park which is the site of the historic Atalaya Moorish-style castle, where the Huntington's resided. A noted scholar of Spanish culture and art, Archer Huntington modeled the couple’s winter home in the style of the Moorish architecture of the Spanish Mediterranean coast. Atalaya is listed as a National Historic Landmark. The park's freshwater lagoon, saltmarsh, maritime forest and beach are outstanding examples of the states natural coastal environment. The park is widely recognized as one of the best birding sites along the East Coast. In the 1930's Archer M. Huntington acquired land from the Starrett family for a homestead he called Stanerigg. He willed the estate to the State of Connecticut for a state park. The 883 acre park spreads over fields and dense woodlands and includes five ponds. It was opened to the public in 1973 after Mrs. Huntington's death. Two statues by Anna Hyatt Huntington grace the entrance to Collis P. Huntington State Park in Redding and Bethel, Connecticut. One statue shows a mother bear with her cubs and the other statue shows two wolves howling. 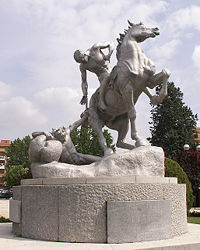 Los Portadores de la Antorcha ("The Torch-bearers"), cast aluminum, Ciudad Universitaria, Madrid. Joan of Arc, Riverside Drive, New York City, Gloucester, Massachusetts and Blois, France for which she was made a Chevalier of the Legion of Honor by the government of France in (1915). El Cid, Hispanic Society of America (New York City), California Palace of the Legion of Honor (San Francisco, California), Washington, D.C., and Balboa Park, San Diego, California, and Seville, Spain (1927). José Martí, Central Park, New York City, begun in the mid 1950s, when the artist was over eighty years old, but not unveiled until 1965 due to the political ramifications of so honoring a Cuban nationalist. Andrew Jackson, A Boy of The Waxhaws, Andrew Jackson State Park, Lancaster, South Carolina, depicts a young Andy Jackson, sitting astride a farm horse. It is a bronze, larger-than-life statue. The statue finished in time for the ceremony marking Andrew Jackson's 200th birthday, in March 1967. This was Huntington's last major work, completed after her ninety-first birthday. The statue is located at Andrew Jackson State Park, about nine miles north of Lancaster, South Carolina, just off US 521. General Israel Putnam, Putnam Memorial Park, Redding, Connecticut, commemorates General Putnam's escape from the British in 1779 when he rode down a cliff at Horseneck Heights in Greenwich, Connecticut. The statue is located at the intersection of Routes 58 and 107 at the entrance to Putnam Park. Other equestrian statues by Huntington greet visitors to the entrance to Redding Elementary School, Rt. 107 and John Read Middle School, Rt. 53 and at the Mark Twain Library, Rt. 53, all in Redding, Connecticut. The statue at the elementary school is called Fighting Stallions and the one at the middle school is called A Tribute to the Workhorse. 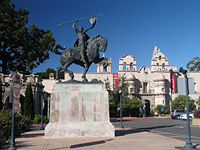 Horse Trainer is located in Balboa Park, San Diego, California. The Discovery Museum, Park Avenue in Bridgeport, Connecticut, one mile south of Merritt Parkway Exit 47; cast bronze. The University of South Carolina's Wardlaw College cast bronze. Stevens Institute of Technology, Hoboken, New Jersey cast aluminum, April 1964. The Chrysler Museum of Art, Norfolk, Virginia cast aluminum, 1957. 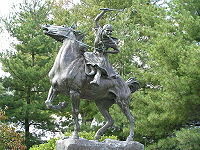 The sculptor created a statue of Sybil Ludington to commemorate the 1777 ride of this 16-year-old who rode forty miles at night to warn local militia of approaching British troops in response to the burning of Danbury, Connecticut. The statue is located on Rt. 52 next to Glenedia Lake in Carmel, New York (1961). A peaceful statue of Abraham Lincoln reading a book, while sitting on a grazing horse is located in front of the Bethel Public Library, Rt. 302 in Bethel, Connecticut. The statue bears the signature, Anna Huntington, with the date of 1961. Conquering the Wild overlooks the Lions Bridge and Lake Maury at the Mariner's Museum Park in Newport News, Virginia. Anna Hyatt Huntington died on October 4, 1973, in Redding, Connecticut, following a series of strokes. She is buried at Woodlawn Cemetery in New York City, New York in the Huntington Family Tomb with her husband Archer Huntington, the philanthropist who founded the Hispanic Society of America in New York City. Huntington received numerous awards, including the Chevalier Legion of Honor, the Purple Rosette from the French government, the Shaw Prize and gold medals from the Pennsylvania Academy and the Allied Artists of America. She was a member of the Associate National Academy, the National Academy of Design, the National Sculpture Society, the American Federation of Arts, National Institute of Arts and Letters, and the National Association of Women Artists. Huntington's work is recognized in many private collections and museums, including the New Britain Museum of American Art, the Denver Art Museum, the Museum of New Mexico, the Boston Museum of Fine Arts, the Metropolitan Museum of Art, the Brookgreen Gardens, and the National Museum of Wildlife Art. The Anna Hyatt Huntington Papers Special Collections Research Center is located at the Syracuse University Library. The 1920 Anna Hyatt Huntington Bronze Sculpture, Yawning Tiger, was appraised at between $8,000 - $12,000 on July 8, 2006 on an Antiques Roadshow filmed in Mobile, Alabama. Brookgreen Gardens is a National Historic Landmark with the most significant collection of figurative sculpture, in an outdoor setting, by American artists in the world, and has the only zoo accredited by the Association of Zoos and Aquariums on the coast of the Carolinas. 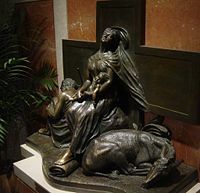 Bob Hope's crypt grotto features a bronze sculpture replica of Anna Hyatt Huntington's The Holy Family Resting --- Flight into Egypt, located at The Basilica of the National Shrine of the Assumption of the Virgin Mary in Washington, D.C..
↑ Anna Hyatt Huntington and the Huntington Great Danes Huntingtonbotanical.org. Retrieved July 22, 2008. ↑ National Museum of Women in the Arts Nmwa.org. Retrieved July 22, 2008. ↑ Joan of Arc Nycgovparks.org. Retrieved July 22, 2008. ↑ Encyclopedia of World Biography Encyclopedia.com. Retrieved July 22, 2008. ↑ Michelle Mackel. 2005. Diana of the Chase Huntington Botanical.org. Retrieved July 22, 2008. ↑ Dorothy Fansler. 2006. Atalaya and Huntington Beach State Park Huntingtonbotanical.org. Retrieved July 22, 2008. ↑ Michelle Mackel. 2005. Diana of the Chase Huntingtonbotanical.org. Retrieved July 22, 2008. ↑ Huntington, Archer Milton Tshaonline.org. Retrieved July 22, 2008. ↑ Daniel E. Harmon. 2005. Wayfaring through the Waxhaws Knowitall.org. Retrieved July 22, 2008. ↑ Artist Biography Wildlifeart.org. Retrieved July 22, 2008. ↑ Anna Hyatt Huntington Papers Library.syr.edu. Retrieved July 22, 2008. ↑ The Roadshow Archive Pbs.org. Retrieved July 22, 2008. ↑ Lincoln's Home Town Ornament Series Abelincoln.com. Retrieved July 22, 2008. ↑ Paula Doyle. 2005.Bob Hope Memorial Garden opens at San Fernando Mission The-tidings.com. Retrieved July 22, 2008. Anna V. Hyatt Huntington – Artcyclopedia.com. Huntington Statue In Andrew Jackson State Park – Free.pages.genealogy.rootsweb.ancestry.com. Pettus, Louise. 2006. Interview with Anna Hyatt Huntington – Aaa.si.edu. Seckler, Dorothy. 1964. Anna Hyatt Huntington – Encyclopedia.com. National Museum of Women in the Arts – Nmwa.org. Anna Vaughn Hyatt Huntington – Findagrave.com. History of "Anna Hyatt Huntington"
This page was last modified on 18 November 2016, at 20:32.